MERSEYSIDE Police are appealing for witnesses or anyone who can identify a motorcyclist who collided with a cyclist, on a footpath in Aintree. The incident happened at around 5.10pm, on Thursday, 23 July 2015, on the loop line footpath near Crescent Road in Aintree. Officers believe the suspect was riding an unregistered off road motorcycle at high speed on the footpath and ran head on into a pedal cyclist, causing serious injuries to the cyclist, including a broken collarbone and 3 broken ribs. The pedal cyclist is profoundly deaf and so did not hear the approaching motorcycle until it collided with him. 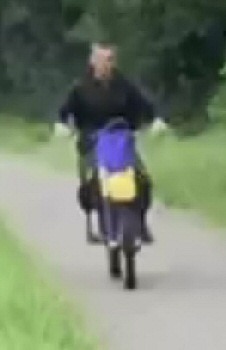 Officers have issued a picture of a person who they would like to speak to in connection with the incident. Inspector Chris Dillon ​said:- "We would appeal to anyone who was using the loop line on that day and who may have witnessed the incident, or knows who was riding the bike to come forward. The offender's actions are particularly heartless and callous as he stopped and looked at the seriously injured cyclist for a few seconds before riding away at speed." Anybody who may have seen the incident, or who can identify the person in the photograph, is asked to contact the MSOC Roads Policing Department on:- 0151 777 5747 or Crimestoppers on:- 0800 555 111.